Within a few months of opening the boutique demand generation business in St. Petersburg, Snee began working locally with the Florida SBDC at Pinellas County Economic Development. “As a company that targets Fortune 100 through to mid-market companies that have been through recent Series B funding, our positioning in the marketplace is essential so the branding and online presence makes a world of difference,” he said. 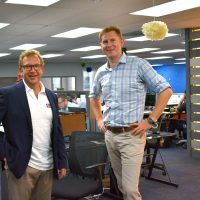 Since working with the Florida SBDC at PCED, Inside Sales Solutions has grown from three employees at its St. Petersburg location, to now employing 50 people. While he recommends the Florida SBDC at PCED for other businesses, Snee says there are many city, county and state resources the company has found useful. They are also involved in local organizations that have helped to position them in the marketplace, such as the Edge District and the local chamber of commerce. While Inside Sales Solutions continues to push the envelope, Snee says he will continue to use the Florida SBDC at PCED for its expertise. "They really gave us more senior level consulting services. With that level of experience and expertise, it really helped take us to the next level. We’ve matured as a company as a consequence of that, but continue to rely on the SBDC’s external consulting evaluation of what we’re concocting internally."